Just for fun, this week only we're "hoppy" to be giving away special Easter Egg Scratch & Win Cards* with every epigenetic product purchased April 15th through April 19th. You could win gift cards, cooler bags, movie tickets, and more. Plus, every card is a winner! Simply scratch off each card to reveal what you've won. Then, redeem the unique code that appears on the card by entering it in the form at the right of this page. Codes must be redeemed by July 31, 2019. » Fill your basket now! *Promotion is for any product purchased between 9:30am ET 04/15/2019 and 11:59pm ET 04/19/2019. Excludes services and instruments. One Scratch & Win card will be enclosed in the packaging for each product purchased. Prizes indicated under the scratch area of the card will have a unique code that must be redeemed here in the box to the right. Codes are not transferable and will expire after July 31, 2019. No purchase necessary to participate. 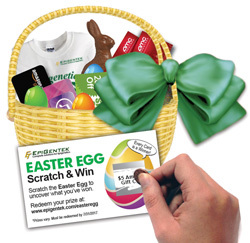 You may request a Scratch & Win Card without purchase by sending a self-addressed stamped envelope to EpiGentek Group Inc, Request, 110 Bi County Blvd. Ste 122, Farmingdale, NY 11735. Your request must be mailed and post marked on or before April 19, 2019. Limit one Scratch & Win Card per request. US orders only. Void where prohibited. Customer is responsible for adhering to his or her company's or institution's gift policies for compliance. Actual retail value (ARV) may vary depending on the item. ARV will be indicated directly on the item upon delivery or may be one of the following items: (a) one $1 Amazon.com eGift Card ($1.00 ARV); (b) one $2 Amazon.com eGift Card ($2.00 ARV); (c) one $5 Amazon.com eGift Card ($5.00 ARV); (d) one $15 Google Play Gift Card ($15.00 ARV); (e) one EpiGentek cooler bag ($15.00 ARV); (f) one AMC movie ticket ($15.00 ARV); (g) one EpiGentek "swag pack" filled with various items ($20.00 ARV). Gifts will be either physically or electronically mailed to the purchaser address after the promo code and required information is entered online properly. Please allow 4-8 weeks for delivery of gift items. Promotion not valid for or through resellers, distributors, or any other third party companies. Amazon.com®, AMC®, and Google play® are not sponsors of this promotion. Except as required by law, Amazon.com Gift Cards ("GCs") cannot be transferred for value or redeemed for cash. GCs may be used only for purchases of eligible goods on Amazon.com or certain of its affiliated websites. For complete terms and conditions, see www.amazon.com/gc-legal. GCs are issued by ACI Gift Cards, Inc., a Washington corporation. ©, ®, ™ Amazon.com Inc. and/or its affiliates, 2019. No expiration date or service fees. For more information on AMC® movie tickets, please see terms & conditions. For more information on Google Play® gift cards, please see terms.